Philip Seib argues that the advent of social media and social networking sites have brought about a new form of diplomacy, one that must contends with global events taking place in real time. In an age when a single video documenting the brutal oppression of a demonstration circles the globe within hours, foreign ministries are required to expedite working routines in order to affect the coverage and framing of international affairs. According to Seib, this is the practice of real time diplomacy. This week brought with it an opportunity to evaluate Seib’s thesis and the extent to which diplomatic institutions do in fact practice real time diplomacy. On the 22nd of June, 2014, a United Nations Independent Commission of Inquiry into the 2014 Gaza Conflict published its findings in the form of a 34 page report. The publication of the commission’s results was announced with a single tweet published on the UN Human Rights Council Secretariat twitter channel. The first to comment on this report were media outlets throughout the world. Within one hour of the report’s publication on twitter, its main findings were published by Israeli, French, Spanish, British, American, Indian and Australian news sites. From Israel’s Haaretz newspaper to France’s Le Monde and Australia’s Sydney Morning Herald, the UN Commission’s findings that war crimes may have been committed by Israel and Hamas alike made headlines. As can be expected, these stories did not include an in-depth analysis of the Commission’s findings nor did they offer insight with regard to the impact this report would have on Israel and Palestine. Rather, they offered a general summary of the Commission’s recommendations and quoted figures from the report (e.g., number of civilians killed). The media’s ability to hastily publish articles on the report was made possible thanks to the UN’s use of infographics in its tweets. 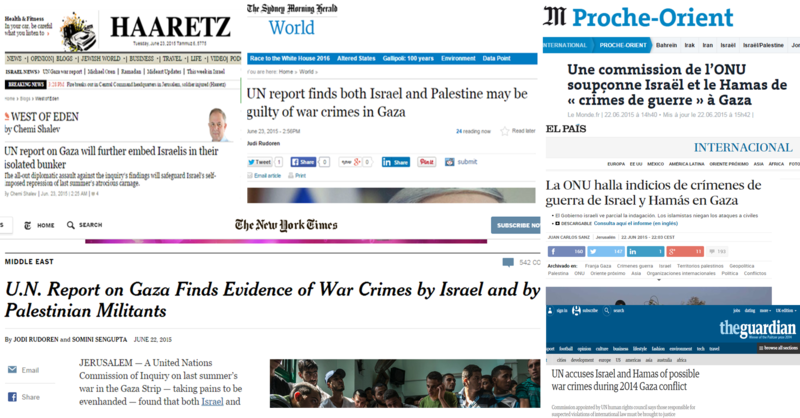 The speed with which news sites published articles on the Gaza report may be an example of “real time journalism”. Once a major story breaks, news sites must immediately publish a concise article while adding commentary and analysis at a later time. News articles published around the globe included a statement by Israel’s foreign ministry. 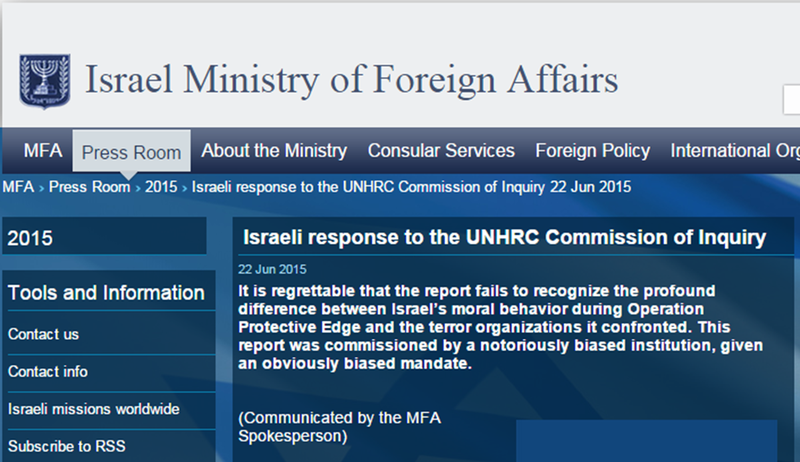 At that time, the Israeli MFA was the only diplomatic institution to comment on the Gaza report. In a series of tweets published on its twitter channel, the Israeli MFA articulated its arguments against the commission and its main findings. Israeli response to the #UNHRC's COI: The process that led to the production of this report was politically motivated & morally flawed. However, the vast majority of news sites did not embed or use these tweets. Instead they quoted a lengthy press release published by the Israeli MFA’s spokesperson on his official website. The second group to comment on the report was NGOs and human rights activists. Within two-three hours of the report’s publication, non-governmental organizations focusing on human rights, war crime accountability and Palestinian independence tweeted the Commission’s findings. These tweets did not simply link to news articles or the report itself. Most tweets included some form of commentary. Such is the case with the tweet below published by Amnesty International UK which states that the report is an important step for justice while including picture of a Palestinian child looking at the destruction around him. Such framing creates a context through which followers are meant to read the report. It is not surprising that NGOs and activist were quick to comment on the Gaza report. These actors do not need to read the 34 page document and contemplate their response. Rather, they can immediately make use of its main finding in order to promote their agenda and influence news coverage and public opinion. The third group to comment on the Gaza report was political actors, especially in the US where the Israeli-Palestinian conflict is both a domestic and foreign issue. Political actors began commenting on the report some six hours after it was first published, perhaps due to the time difference between Geneva and Washington D.C. In addition, Pro-Israel Jewish organizations also commented on the report. Such is the case with tweet below published by the Anti-Defamation League (ADL). Like NGOs and activists, politicians are also in a position to immediately comment on world events as these are instruments for gaining political capital and promoting one’s own political agenda. Diplomatic Institutions- Real Time Diplomacy? This post was written 24 hours after the Gaza report was first published. Currently, no foreign ministry has commented on this report on twitter. Likewise, no Missions to the UN in Geneva have commented on the Commission’s findings or its recommendations. It stands to reason that MFAs and diplomats are now in the process of analyzing the report. Such an analysis requires cooperation between different departments in MFAs. The legal department may be assessing the Commission’s general recommendation of launching a probe into the actions of Israel and Hamas in the ICC while diplomats tasked with promoting Israeli-Palestinian negotiations may contemplate the report’s impact on future dialogue between both sides. To date, both the State Department and White House spokespersons have commented on the report. However, these spokespersons did not take to twitter but preferred more traditional forms of diplomacy- being quoted in a Reuters article. Both their comments, shown in the image below, demonstrate diplomacy’s ongoing need for time when responding to complex global events. This post attempted to evaluate the practice of real time diplomacy. The analysis presented here offers three main conclusions which all warrant further attention and investigation. First, it seems that diplomatic institutions still require time when faced with complex issues such as the Gaza report which deals with a variety of issues ranging from the International Criminal Court to the conduct of warfare, human rights and the future of the Palestinian-Israeli conflict. It is much easier for MFAs to condemn a terrorist attack in real time than it is to formulate a response to a UN report. Thus, real time diplomacy may currently be limited to “simple diplomacy”. Secondly, a time gap may exist between diplomatic institutions and other actors in the global arena such as NGOs, activists and political institutions. This could suggest that by the time MFAs respond to a given issue, it has already been framed online by sub-state actors and the media. This begs the question- how can MFAs effectively impact public opinion and the coverage of events when they are the last to comment on the issue at hand? In other words, how can MFAs mind the gap? Finally, it seems that morality continues to play an important role in in diplomacy. Israel’s MFA focused on what it perceives as a moral gap between its actions and that of Hamas. Morality was also present in the House Foreign Affairs Committee’s tweet and it was the moral dimension of the Israeli MFA’s spokespersons press release that was quoted in all news sites. Posted in Uncategorized and tagged 2014, digital diploamcy, diplomacy, Gaza, Gaza conflict, Israel, media, news sites, Palestine, real time diplomacy. Bookmark the permalink.